U.S. News and World Report’s 2014 Best Colleges guide ranked Wake Forest 23rd among 281 national universities — the highest ever ranking for the University. Wake Forest has been ranked in the top 30 in the national universities category for 18 consecutive years. It is the fifth time the University has been ranked in the top 25. The guide also ranked Wake Forest 11th on its “Strong Commitment to Teaching” list, 34th on its “Great Schools, Great Prices” list and recognized the university for its commitment to economic diversity among its students. The guide highlighted Wake Forest’s 11 to 1 student/faculty ratio as well as small class size. Fifty-nine percent of undergraduate classes at Wake Forest have fewer than 20 students and only 2 percent of Wake Forest’s classes have more than 50 students, the lowest of any top 30 school. In its overall ranking, Wake Forest was tied with Carnegie Mellon University, the University of California-Los Angeles, the University of Southern California and the University of Virginia. Wake Forest had a strong showing in many categories including alumni giving rates, faculty resources and freshman retention rates (94 percent of first-year students returning for sophomore year). For the fourth year, U.S. News asked high school counselors to rank the top colleges and universities and Wake Forest was rated 4.4 on a five-point scale. Wake Forest was ranked 27th in last year’s edition. 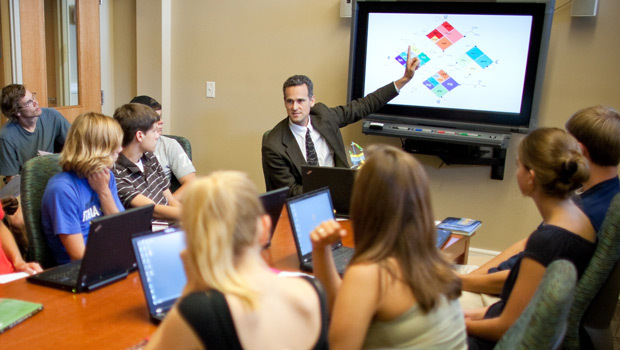 The Wake Forest School of Business undergraduate program was ranked 34th in the nation among a total of 401 accredited business schools that were considered. In the U.S. News and World Report specialty ranking, Wake Forest ranked in the top 5 percent nationally at 18 and secured its top-20 position in the Accounting category for the fifth consecutive year. The U.S. News rankings are posted on www.usnews.com.